Volunteer firefighter Dave Tree has been regarded as the man who put a little bit of hope and life back into Australia by helping a koala, nicknamed Sam, to survive violent bushfires in 2009. Although koalas are most of the time afraid of human beings, this injured female was so weak and thirsty that she couldn’t run away. “Things do survive the bushfire. There's a koala here. You alright buddy?” said Dave approaching Sam to give her some water in a forest near Melbourne. This video immediately attracted hundreds of thousands of views on YouTube. Unfortunately, she was euthanized last year because she was suffering from a disease typical to koalas. Sam was to become a new symbol of hope for Australians rebuilding their towns, houses and lives. 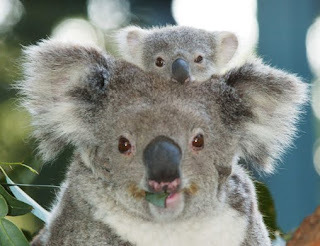 The koala is a marsupial and most of them are found in Australia. They live together in places where different tree species such as eucalypts are growing on suitable soils. Koalas are lazy animals and spend about three hours to eat 500 g eucalyptus each day. Koalas are the icon of the Australian fauna but may also become that of climate change. Actually, the rise in concentrations of carbon dioxide in the atmosphere that lowers the quality of eucalyptus is harmful for their health since they are dependent on this food. This is why it is important for them to be protected. In 1988, the Premier of New South Wales declared at the Koala Summit “If the Panda is the international symbol for the conservation of endangered species, than the Koala is our diplomat for Australia’s unique fauna, as well as for the Australian bush”. Thousands of koalas have recently disappeared especially because of the deforestation, the violent bushfires and the dog attacks. Nowadays there is no federal specific legislation for the preservation of koalas. In fact, each state has its own legislation. Internationally, the koala is listed as ‘potentially vulnerable’. Members of the Australian Koala Foundation (AKF) have urged the Environment Minister to create national laws for koalas. Founded in 1986, this non-governmental organization’s aim is to protect koalas from many injuries and threats. The loss of their habitats is due to deforestation and is the cause championed by AKF’s campaign ‘No Tree, No Me’. AKF has also different ongoing projects designed to (re)create suitable habitats for them. There also are places where koalas are kept as in the Lone Pine Koala Sanctuary located in Brisbane. This is the largest and oldest koala sanctuary in the world. The sanctuary has not only been designed for koalas but also for other typical Australian animals. 30 koalas are kept in the ‘Koala Forest’ where people can even hold them for a few minutes. Finally, the AKF also proposes several ideas to help protecting them: you can, for example, buy koala gifts or simply donate. However, the most incredible thing YOU can do for the conservation of wild koalas is to adopt a koala! You simply adopt one and pay a monthly adoption donation. You then receive a sort of ‘identity card’ of your koala and pictures of it. You also have the opportunity to go and see your koala in Australia! This little koala is so cute !